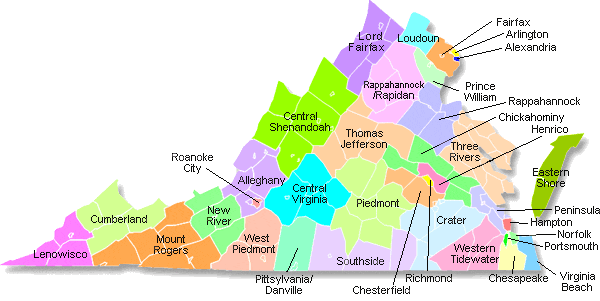 What makes the Piedmont a distinct region of Virginia? Most Virginians living just east of the Blue Ridge would recognize the term. Piedmont originally referred to the equivalent area between the Alps and the Adriatic Sea in Northern Italy. There are other regions outside Virginia that are also "foothills," including the Arctic Foothills between the Brooks Range and the Arctic Ocean. ...landform created at the foot of a mountain (Italian: ai piede della montagne) or mountains by debris deposited by shifting streams. Such an alluvial region in a humid climate is known as a piedmont for the Piedmont district of Italy; in arid climates such a feature is called a bajada. The Piedmont extends completely through Virginia, as a physiographic region east of the Blue Ridge. Culturally, the boundaries - or even the existence of the Piedmont as a distinct region - is less clear. The northern Piedmont is a triangle between Washington, DC, Richmond, and Charlottesville. Virginia's fastest-growing counties are the suburbs of those urban centers. Highways connecting those cities are one way to establish boundaries for the region - I-95 on the east, I-66 on the north, US Route 29 on the west, and I-64 on the south. The eastern boundary is the Fall Line. The western boundary of the Piedmont is near the Blue Ridge mountains, but can be drawn in different locations. A lumper might include the rise up to the crest of the Blue Ridge, while a "splitter" would stop at the base of the mountains and separate the Blue Ridge region from the foothills. The Piedmond Environmental Council is active in the Blue Ridge counties from Loudoun south to Albemarle. The organization focuses on what it describes as the "Northern Piedmont." It does not have land officers active in Fairfax, Prince William or Stafford counties in northern Virgnia, or Fluvanna, Louisa, or Goochland counties further south. There is a land officer across the Blue Ridge in Clarke County, reflecting that jurisdiction's historical linkage to the east in contrast to Frederick County. The boundaries of the cultural region known as the Piedmont in Virginia do not coincide with the physical boundaries accepted by geologists and hydrologists. The volcanic lava of the Blue Ridge extends far enough to the east to lie underneath Warrenton and Charlottesville, but most Virgininans would consider those communities to be in the Piedmont. Though Manassas, Fairfax City, and Falls Church are in the Piedmont physiographic province, those communities are most commonly considered to be part of Northern Virginia. The Piedmont is composed, geologically, of a series of igneous and metamorphic rocks that were "smushed" onto the North American coninent in a series of collisions. The different terranes or chunks of rock were all squeezed and baked, so geologic faults are common. The August, 2011 earthquake occurred in the Choppawamsic Terrane, a former island arc of volcanoes that was compressed into North Anerica when the Iapetus Ocean closed. Groundwater within the Piedmont province moves through the faults and fractures in the bedrock. A drinking water well could produce just a few gallons per minute, or hundreds, depending upon whether it intercepted a fracture. In contrast, to the east in the Coastal Plain the groundwater moves through unconsolidated sediments. South of the James River around Lynchburg, there are many businesses and government offices with "Piedmont" in their name. The foothills of the mountains south of the river are also described as being part of Southside Virginia (stretching south to Danville) or even "central" Virginia (stretching east to Richmond), cultural regions separate from "The Piedmont" north of the James River.